Cork is a natural and renewable material. It’s harvested from the bark of cork oak trees, which are native to Spain, Portugal and Tunisia, and has been used in construction for centuries. It has gained popularity as a flooring product for its “green” traits and its safe, natural materials that retain heat and have an overall warm feel to them. Durable. It resists cracking and abrasions. properly maintained, cork flooring can last 40 years or more. colours and sizes. Use planks to create an almost seamless-looking floor, or use tiles in single or alternating colours to create a nontraditional effect. Practical. Unlike vinyl, the pattern and colour of the cork penetrate the thickness of the material, so they’re retained as it wears. This lengthens the usable life of the flooring. Environmnetally friendly. Cork is manufactured from natural and renewable materials. It has gained popularity for its “green” traits in production. Bedrooms & Living Rooms Cork has extraordinary insulating traits and is exceptionally comfortable to walk on – it has lots of cushion and give which makes it a joy for bedrooms and living rooms. Cork also reduces heat-loss in rooms. Bathrooms & Laundry Rooms. Cork flooring is impermeable to gasses and liquids, making it a great choice for rooms that are prone to water spillage. Hallways. Cork as a material is sound-dampening and reduces echoes, making it a fantastic choice for high-traffic areas, especially near bedrooms. 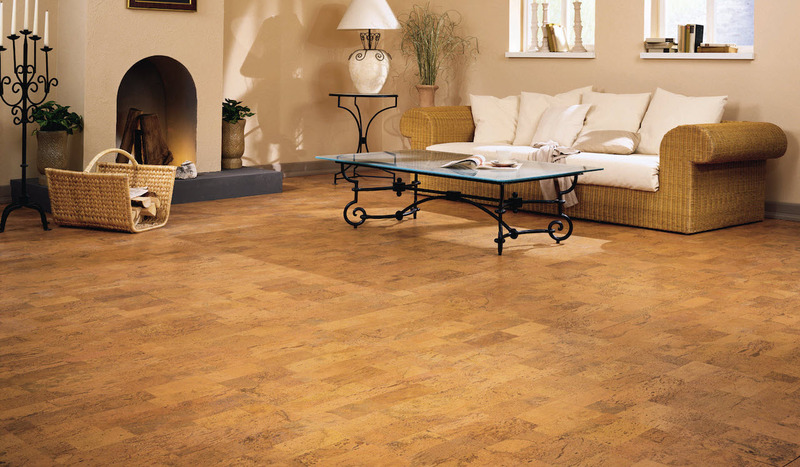 Get a free estimate on a new cork floor today! Visit Sherwood Flooring to browse our selection of cork flooring products. We’ll help you choose the perfect style and stay within your budget.